Are you an ardent karaoke fan willing to organize your favorite entertainment within the comfortable home environment and in your own style rather than spending a fortune in local karaoke clubs singing the same cloying songs again and again? Good news for you! Enjoying karaoke pastime in the privacy of your own home together with your family and friends has never been easier with an excellent choice of feature-rich karaoke software solutions available on the market today. They are typically very easy to install and allow to play karaoke tracks just on your standard home PC or laptop with no additional hardware required. Frankly speaking, computer karaoke applications have made a real breakthrough in the related field by changing completely the concept of playing karaoke. Nowadays, they present smart and cost-effective alternatives to bulky and rather expensive karaoke machines with all their associated drawbacks. You can find the review of three top ranked karaoke player solutions below that will help you turn your home computer into a sophisticated, full-fledged karaoke machine in no time. KaraFun Player is an advanced karaoke application for Windows-based computers that is absolutely free to download. It comes with a wide range of features that are quite essential to meet your karaoke singing passion and let you run an exciting home karaoke party. You will be able to play various popular karaoke formats (KAR, MID, KOK, LRC, KFN, MP3, CDG as well as AVI and MPG video files), change the pitch and tempo of any song, record your own singing, reduce vocals from MP3 tracks, chance lyrics backgrounds, add live effects, choirs and some other features. However, there is an important option to note – free karaoke player KaraFun gives you access to only 30-second song samples that are available in the KaraFun Online song catalog. If you want to avoid these limitations, you are allowed to play your own karaoke files or you may subscribe to KaraFun Online options and for a certain fee enjoy unlimited access to the entire karaoke library (11,000 songs) that is available on their website online. Therefore, you need to have your computer always connected to the Internet in order to access the online catalog. PCDJ Karaoki is rather powerful, yet easy-to-use karaoke show hosting software designed for both karaoke enthusiasts and professional karaoke jockeys. It supports MP3+G, WAV+G, karaoke Zip formats and multiple video files to display distinct on-screen lyrics. 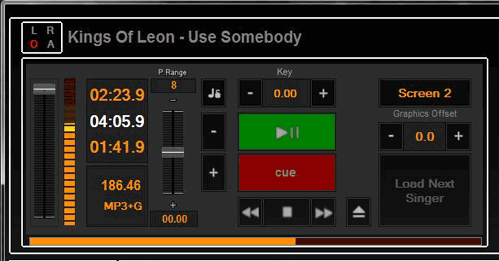 Karaoki includes an on-deck singer list with history, key control option, jukebox background music player, library printer, news ticker and a bunch of other advanced features and tools that karaoke professionals may require. Using PCDJ Karaoki will let you avoid the necessity to carry piles of CDG discs or heavy karaoke equipment, since it allows to play any karaoke audio and video files that are stored on your PC or laptop hard disk. Unlike KaraFun Player, PCDJ Karaoki isn’t available free of charge. However, with regards to its rich functionality and the level of flexibility provided, some karaoke fans and professionals consider PCDJ Karaoki worth investing. Siglos Karaoke Player/Recorder 2 is a revolutionary, completely new software solution by Power Karaoke focused to deliver an ultimate karaoke playing and singing experience for karaoke enthusiasts, professional singers and KJs. It is powerful and feature-rich enough to turn your standard home computer into a sophisticated, professional karaoke studio in a matter of minutes. 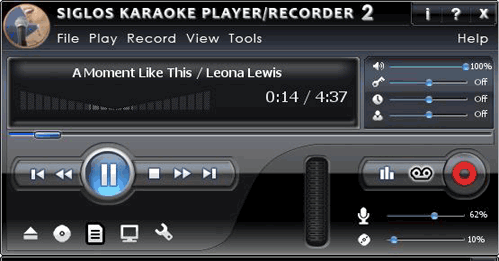 While supporting virtually all karaoke formats existing today, Siglos Karaoke Player/Recorder 2 provides an incredibly extensive toolkit, though costing only a half of PCDJ Karaoki price. You can take advantage of built-in advanced sound processing tools, numerous image enhancement options, video and live camera backgrounds, dual monitor support option, full screen mode, voice recording tool, Multiplex control, playlist management options and many other remarkable opportunities to deliver an ultimate karaoke experience for your guests. To sum up, all these three computer karaoke players have something unique to offer and may take your karaoke pastime to the next level. While KaraFun Player is available free of charge (with substantial limitations though), PCDJ Karaoki and Siglos Karaoke Player/Recorder 2 come with free trial versions, so that you can always have an excellent opportunity to see them in action before making the final decision. 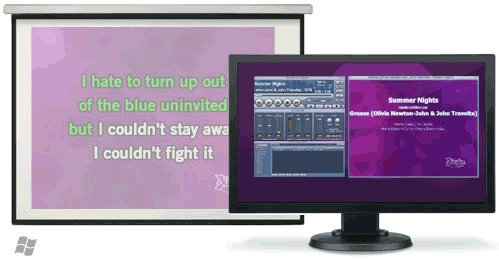 Have you ever tried any of these karaoke software solutions for you home karaoke parties or in your professional KJ work? Feel free to share your personal experience or any other related ideas in the comments below. Christopher Mayson is a product manager at PowerKaraoke.com, a company specializing in karaoke software development. I know that a lot of people are really into Karoake. This includes a friend of mine. She really likes it. I tolerate it. I don’t like it. But this software would probably be something that she would enjoy a great deal. Thank you.